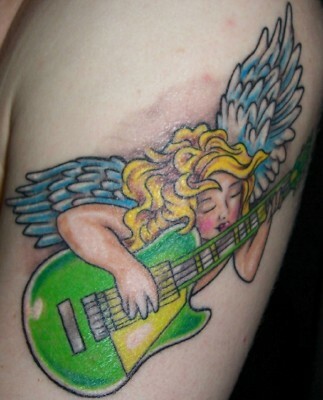 For years we had thought about getting tattoos that worked together as a set but had never found a suitable subject. In 2010, he went back to school as English major while I was entering the first year of my MFA in creative writing. While visiting over the winter break and planning our mother's 60th birthday party, talk came around to the poems we memorized a kids and renewed our efforts to find a good set of tattoos. 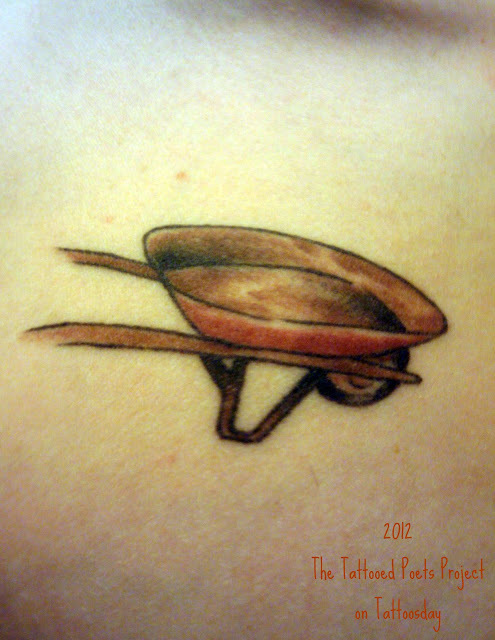 'The Red Wheelbarrow,' with two perfect, ready made images, solved our dilemma. 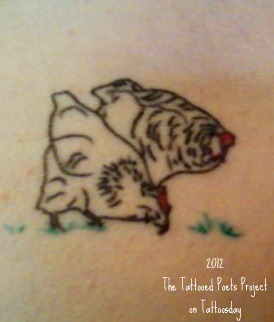 That night we drew up a pair of white chickens for him and a red wheelbarrow for me and the next day had them done. Because Williams made use of the rhythm and diction of the American vernacular, we choose a local tattoo parlor that seemed analogous. 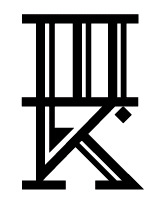 The website for Hell Bomb Tattoo, in Wichita, KS, displayed an index of, what we imagined to be, classic Mid-Western tattoo art." Alex Dryden is a MFA candidate in Poetry at The New School. His work was most recently published on The Best American Poetry blog. 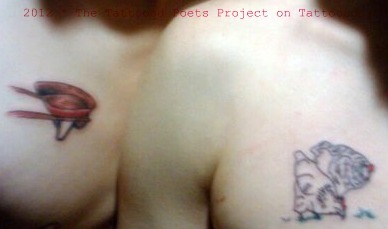 Thanks to Alex for this contribution to the Tattooed Poets Project on Tattoosday!